Terming it the tallest ultramodern project Africa has seen, a Kenyan newspaper extolled the virtues of the Pinnacle Tower, a building under construction in the capital Nairobi. The Business Daily said the edifice would have 70 floors and rise to 314 m. It has a price tag of about $200 million, the publication said in its profile of the owners, who described their project as an African “statement”. Kenya’s President Uhuru Kenyatta in May 2017 laid the foundation stone for the project, which has a completion date of 2021. So, is it the tallest building on the continent as widely reported? Who keeps count of tall buildings? The building’s reported height has varied, including at 320 m, 300 m and even 274 m.
The Council on Tall Buildings and Urban Habitat is a not-for-profit organisation based in Chicago, USA. It has developed international standards for measuring and defining tall buildings and makes its criteria public. Other organisations such as the Royal Institution of Chartered Surveyors also focus on standards but do not maintain a database of tall buildings. 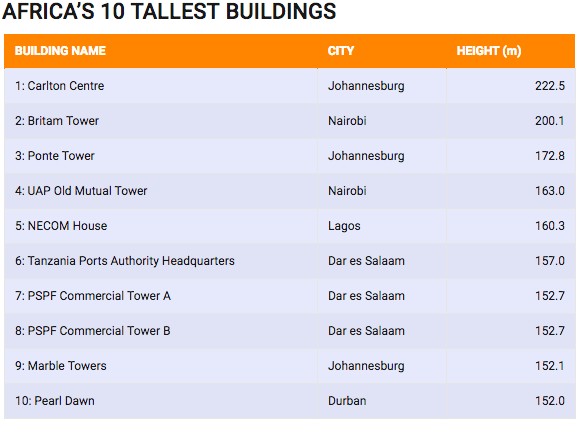 The council on tall buildings disseminates its finding in various ways including publications and technical reports, Shawn Ursini, the editor of the council’s database, told Africa Check. It also provides third-party ratification for organisations such as the Guinness Book of World Records. The database gleans its information from “official documentation such as building drawings, supplemented with local government approvals and permits to confirm heights, construction starts and completion dates”, Ursini said. Africa’s current tallest building is The Carlton Centre in Johannesburg, South Africa, he said. It is 222.5 m high. To qualify, a building must be used for either residential, office or manufacturing purposes, meaning those used for communication or observation aren’t considered. “The architectural/official height is determined as the measurement from the lowest open-air pedestrian entrance to the highest permanent architectural element, not including any functional equipment such as antennas, flag poles or lightning rods,” Ursini said. Nairobi is also home to the continent’s confirmed second tallest building, he added. This is Britam Tower, which stands at 200.1 m.
But none of the continent’s skyscrapers feature in the world’s 100 confirmed tallest buildings, which is led by the 828 m-high Burj Khalifa in Dubai, United Arab Emirates. A Kenyan newspaper declared the under-construction Pinnacle Towers in Nairobi as Africa’s tallest building, only the latest publication to refer to it as such. The Council on Tall Buildings and Urban Habitats through its Skyscraper Centre database keeps tabs of the height of global buildings. 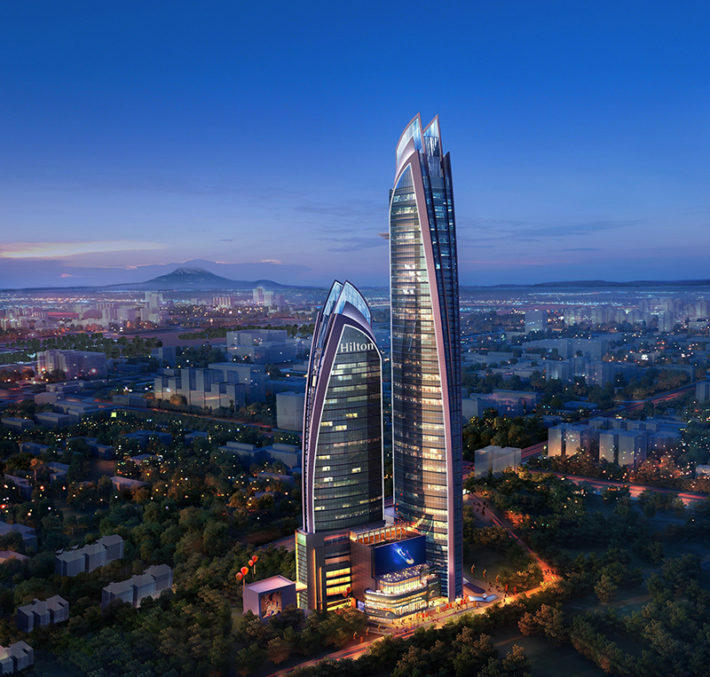 According to it, the Nairobi building will qualify as the continent’s tallest – when completed. Until then, Johannesburg’s Carlton Centre remains the king of the African skies.